I love the idea of building an “interactive style guide” for a website design. I really do. However, working in Agencyland, it can be extremely difficult to budget enough time for this kind of tool when seemingly higher-priority tasks pile up. Right or wrong, the utopian vision of a living style guide often becomes a foregone luxury in the throes of looming deadlines. Assumes the reader understands the basics of Ruby and CSS. For an upcoming project at work, I’ll be leading the effort to author static HTML templates for a different group of software integrators to wire up to a complex back-end architecture (rhymes with WebSmear). Enter Middleman, a loosely-coupled, yet carefully curated collection of Ruby libraries that all contribute to a framework that is much greater than the sum of its parts. I won’t go into all of its features here — you can visit the Middleman site for everything you need to know. For our purposes, Middleman looks to be a robust platform on which to build our static site. I am a closet fan of documentation specs like RubyDoc and JSDoc, but they often introduce a lot of heavy baggage for developers. TomDoc came on the scene not too long ago as a really simple doc spec that Githubbers use in their in-house Ruby code, and I was ecstatic when another Github guy, Kyle Neath, released his own KSS project in late 2011. I think I’ve subconsciously been yearning for this kind of CSS documentation support for some time. KSS is a documentation spec for CSS (one of the first of its kind that I’ve heard of) that can be parsed by Ruby. This helps us do things like… generating an interactive style guide. It’s certainly not a silver bullet, but KSS will lower some of the administrative barriers to putting together helpful CSS documentation. I thought it would be a good idea to try to port some of the KSS example app code over to my basic Middleman app. The example shows several variations of form submit button styles, including states such as hover and disabled, which makes for an excellent use case. I’m using Sass and Compass, with Middleman, so I did a quick port of Kyle’s example button CSS to Sass with some appropriate Compass mixins. I found that KSS broke when used with the original terse Sass format, but it did work fine with the newer SCSS format. I’m not certain, but it’s possible that this issue may be resolved in KSS in the future. 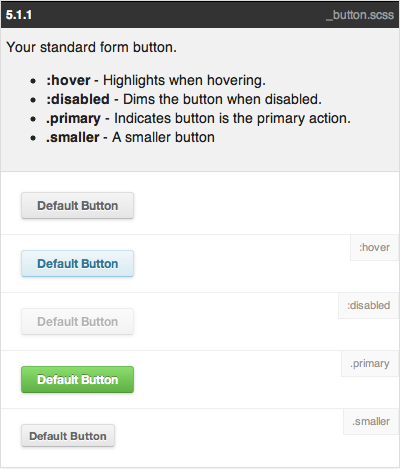 Below is the result of porting the button CSS to _button.scss. The comment block at the top is where the documentation magic happens. You just describe what something is, specify a list of different states, and then reference a numbered section of the style guide. That’s it. // Your standard form button. You actually do need to manage the numeric structure of the style guide yourself. However, I appreciate that KSS makes you maintain control over the meaningful aspects of organizing a style guide, while making it possible to automate the tedious parts. # Generates a styleguide block. # to the output buffer. out, @_out_buf = @_out_buf, ""
For all style guide templates, the above configuration exposes a variable containing a Ruby representation of all KSS-documented CSS in the site (because KSS parses all documentation blocks in the CSS). A couple of helpers are defined that the templates will have access to, in order to handle the generated style guide block. A partial template needs to be defined for rendering every style guide section. The template will be used by the styleguide_block helper defined in the config above: styleguide/_block.erb. Note that there is a single button element in the block. This is where the magic happens, because it passes the button to styleguide_block, which imports the styleguide/block partial for the style guide section. For my project, at least, this is an encouraging proof-of-concept that I plan to take forward. In the meantime, it looks like there is a generous amount of potential in both Middleman and KSS, so be sure to check out each of these projects. If you have used either Middleman or KSS, what has your experience been like thus far? I have pushed my working code to a Github repo. Some of the gems are a little out of date, but I wanted to get my initial version up first, and then work through any issues that might arise from updating libraries. Please let me know what you think; I’m always open to suggestions for improvement. After checking out the code, just run middleman like any other Middleman app, and browse to http://localhost:4567.